It’s shaping up into an intriguing SPOTY market this year with doubts lingering about all of the market leaders. Chris Froome and Lewis Hamilton are vying for favouritism with Froome having just been confirmed to have a crack at becoming only the 10th rider to win two grand tours in the same season by competing in the Vuelta. Hamilton is still odds on to win the F1 championship. There still appears the possibility that there could be a springer from the pack. The World Athletics Championships at the end of August and the Rugby World Cup starting in September are the two main events that could shake up the market. There is though one event in particular that could mean Andy Murray still has a say – the Davis Cup (he’s also second favourite for the US Open). GB beat France in the quarters and are 7/4 favourites to win the cup going into the semis where they play Australia next month. Murray dragged Britain through against France and is by far the best player left in the tournament. GB have home advantage in the semis and would do in the final too if it is Argentina that get through (away to Belgium otherwise). In other countries the Davis Cup is revered and I think there is the possibility of the hype machine being cranked up if GB reached the final which would be in November live on BBC – a win would be Britain’s first since 1936. A home tie would be ideal (with Union Flags flying) as I think the pull on SPOTY voters would be diminished if it was in Belgium. I think now is the time to play as the bookies and punters still consider the impacts of Stuart Broad and Joe Root on the market after England secured the Ashes at the weekend. We can see how the Davis Cup market moves in the coming weeks before potentially laying off to protect our stake. Incidentally out of Broad and Root it may be that only one of them makes the shortlist and I would say that Root is most likely (probably man of the series depending on what happens at the Oval). He is one to watch in the market. Ah SPOTY. It’s become a bit of a laughing stock really. A sign of the times and the general public’s love of the celebrity. How I long for the old fashioned Sports Review of the Year as it used to be. Still, at least there’s some interesting markets! And last night certainly provided a shock to thousands of punters willing to back Rory all the way down to 1.10 in running. The signs had been there ever since the shortlist was announced three weeks ago that Lewis was in with a decent shout. As mentioned in my previous post, the polls gave him a significant lead. 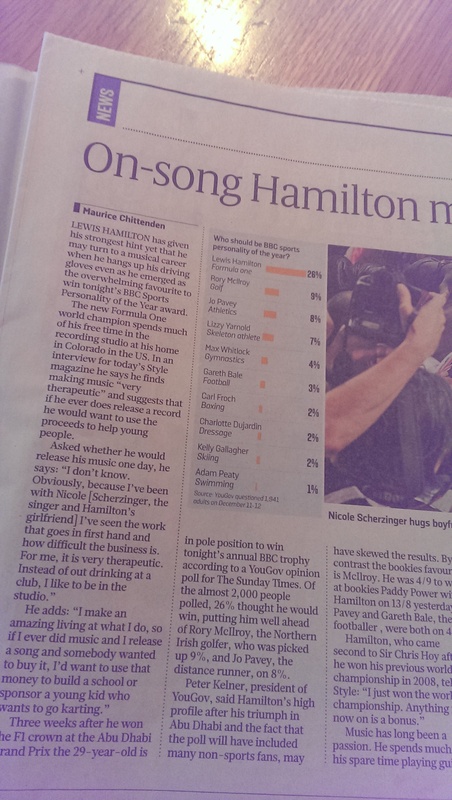 Probably most telling of all was The Sunday Times YouGov poll published yesterday which had Lewis as the clear winner. The market was beginning to react and Rory drifted out to around 1.75 around the time the show started. But then he shortened significantly on the back of his impressive VT in the show. This was interesting as there was still no way of knowing at this point for sure how popular he would be as no official votes had been cast (there was a flash vote with only around a 45 minute window). I was happy enough with my green positions on both the main contenders but tipped the balance slightly more towards Lewis just before the off. I wish I’d trusted the polls a bit more though and gone in a bit harder. There now seems a rule of SPOTY to adhere to: essentially lay any major winning golfer. I had lost confidence in my Bale selection in the week leading up to the big night and was pleased to see my more recent selection of Pavey sneak onto the podium at 13/8. 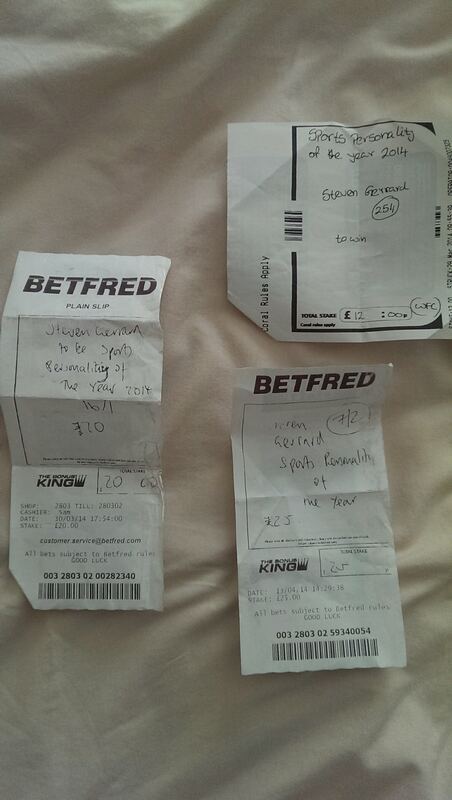 I also tipped the 1-2-3 on the site at 5/1 so hope a few of you got on that, although I only had a fiver on myself. Through the year I made some good calls and bad calls but in my first year of the blog (started in May) I was satisfied with a profit of + 7 points at a return of 29% on points risked (11% on total points staked) – please see BETTING RESULTS 2014 page. The aim of the blog is to provide a nice little profit in time for Christmas at say around £25-£50 a point. As I mentioned in an earlier post my staking for some of the larger priced selections was a bit unrealistic (it didn’t really make too much difference to the stats this time) so I will take that on board for next year as I want the prices to be achievable. I also hope the blog gives readers some good trading angles and ideas beyond the strict selections. Thanks to those who have read the blog – Steven Gerrard trading at 1.74 seems a lifetime ago! Have a great Christmas and I’ll be back in 2015 to do it all again.. So the big night has finally arrived and picking the winner is a bit tricky. In my opinion Rory McIlroy’s achievements are phenomenal and he should win it. 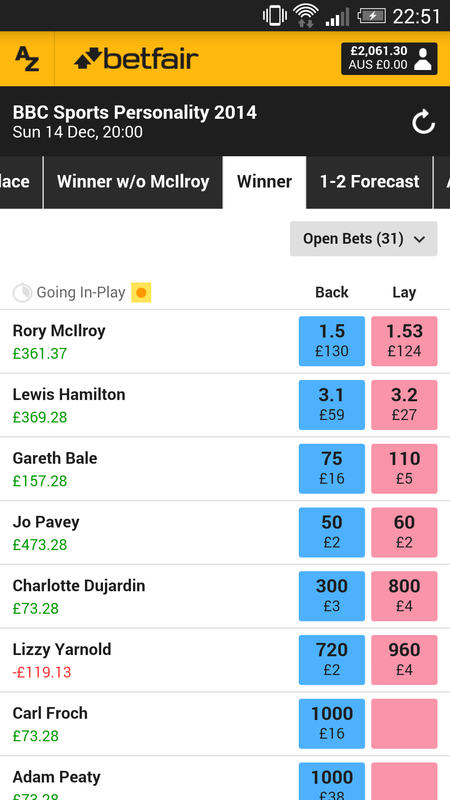 If looking for a bet the trio of Hamilton, McIlroy and Pavey at about 6 on Betfair should give you a good run. I’ll be back in the week with a review once the voting figures are out. With three days to go the Betfair markets are becoming more liquid and firming up. There hasn’t been too much by way of polls to refer to this year but there are a couple of potential indicators that I’ve noticed. The Guardian poll has probably been the most high profile but I could not see how many voted in it. It was open for a good few days so probably a fair number. 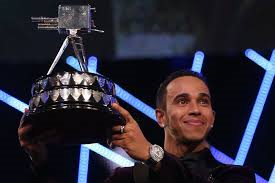 This shows Lewis Hamilton with 42%, Rory McIlroy with 34% and then Jo Pavey with 11%. Gareth Bale is in with the pack on 3%. There are a few other polls dotted around the internet which also show a two horse race. Most of these seem to show the F1 champ ahead. Of particular interest I thought, on the night of the shortlist being announced, was the number of ‘retweets’ and ‘favorites’ for the tweets from the BBC SPOTY for each contender as they were announced. This showed Hamilton far ahead. There was probably a strong recency bias here in that the shortlist was announced the day after the F1 title was decided. The question is how much will this bias wear off, if at all. Rory has slowly drifted out to around 1.6 and is now back in again at about 1.53 but support for Hamilton is very strong (3.1) and this is supported by polls. There may also be a YouGov poll to come at the weekend which I will update on. I’m probably happy enough to leave my current position at the moment, until any further information comes to light. Back on 29 June 2014 I advised a 3 points each-way bet on Gareth Bale at 33/1, a fifth of the odds for top 3. Effectively (assuming he doesn’t win and we lose that part of the stake) if he placed it would lead to a 16.8 points profit. 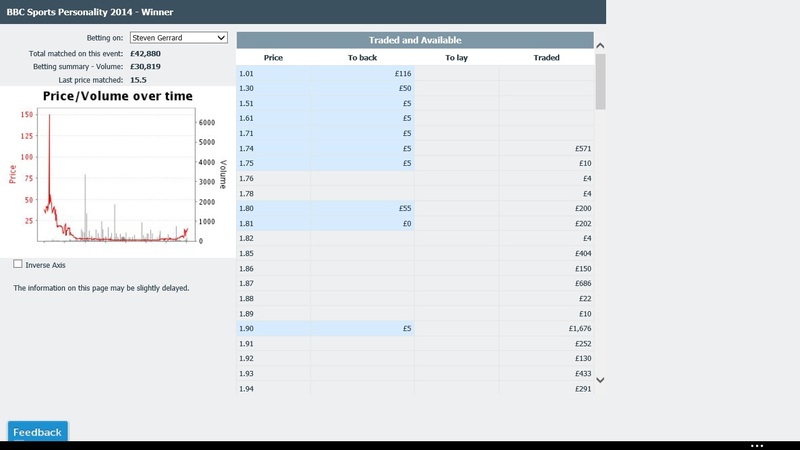 There has been plenty of trading opportunity since the shortlist was announced and I have been slowly laying Bale at around 2.66 to green up my book. I was banking on the Welsh vote but there has been a general lack of support for Bale in social media and perhaps tellingly in Wales’s own SPOTY awards he did not even make the top 3. A real danger I think is Jo Pavey who I have been slowly backing to even up the green top 3 book. She is currently a best priced 13/10 top 3. I’ve noticed quite some support on social media for her and in the polls. Athletes have a fantastic record in SPOTY too. I’ll most likely be advising a play on Pavey before the show, possibly to finish third, depending on prices, to balance our book for what should be a profit. Two sound judges, Ralph Ellis and Joe Dyer at betting.betfair.com make a good case for her here and here. Incidentally a word on my staking for my last selection which was Bale in the without McIlroy market – 8 points at 33/1. On reflection I should have advised a smaller stake of one or two points for such a big price for practical reasons of getting on. There has been plenty of opportunity to trade out for a profit on this selection though – has been around the 17 mark on Betfair for a week or so but I will likely make an official selection to balance the books on this bet. As we approach Sunday I’ll be providing further news and updates and will let you know of any selections. It looks like Pavey is the one to watch. Although not much has really happened, and there is a long way to go, I have managed to get a decent trade in. At the start of the year I am always looking to get a large priced contender on side away from those at the head of the market who tend to be too short based on their actual chances. Essentially that is the key to successful betting – consistently backing that whose chances of winning are greater than their odds imply. If you can consistently back say 5/1 shots who really should be 4/1 shots, you will have a significant edge in the long run and make profits. Finding that edge is the key.. and with a bit of planning (and luck) can be done. In SPOTY betting (as with all betting really) it’s important to get on before the masses clock on to a lively contender. So at the start of the year looking at the sporting calendar and picking out those who are likely to excel is a good place to start. In this respect I had Mo Farah (who has seemed a mainstay of my SPOTY portfolios for a while now) and, a few weeks into the year, Ronnie O’ Sullivan on board. Around February and March Liverpool were extremely impressive and, on thinking there was a good chance they could win the title, I got stuck into Steven Gerrard. I started backing him at 25s, through 16s, 5s and down to 7/2. In the end I had £88 pounds on to win £1,200. The key to a good SPOTY bet is your assessment of what you think that person’s odds will come into if they win the main competition that they are in. I was very confident, with all the publicity that Gerrard would get and the large number of Liverpool fans, that if Liverpool won the Premier League then Gerrard would be pretty likely to win SPOTY. At worst I thought he would go evens money for SPOTY maybe shorter on Liverpool winning. To provide some security and reduce risk I covered my self by simultaneously laying Liverpool for the title – if Liverpool didn’t win it then I did not see Gerrard winning SPOTY (unless England did v well in the World Cup). 30 March 2014: Gerrard was available at 16/1, Liverpool were available to lay at 2.96 or 2/1 on Betfair. 13 April 2014: Gerrard was available at 7/2, Liverpool around 1.83 or 5/6 to lay. So, for example, on 30 March and 13 April I could fairly safely back Gerrard and lay Liverpool without eating much into profit. In fact the edge was so significant here that I layed Liverpool to make a profit either way. I also did similar in the Gerrard SPOTY top three market. My thinking being it would likely be all or nothing for Gerrard – either win SPOTY if Liverpool won the league or not even be nominated if they didn’t. While my punts didn’t work on Ronnie and Mo, with Stevie I am now in a profitable position by trading accordingly. Hopefully there will be some similar situations to come this year that we can exploit when they appear. As ever, please feel free to comment or flag up any potential interesting markets situations. 2014 the story so far.. Normally an even numbered year would see the English footballers featuring fairly prominently in the SPOTY betting markets. The last couple of years though has seen a long overdue sense of realism take over about the prospects of the home grown players. So, at the start of the year, it was left to last year’s landslide winner Andy Murray to head the market at about 5.0. Chris Froome, the impressive 2013 Tour De France winner, was second favourite. Other than that though, the markets suggested that people could not really think of anyone else. And the market leaders would always be vulnerable once the year got underway and British sportspeople started putting top performances in the book. Lizzy Yarnold was first up in February, winning gold in Russia. She traded as short as 4.2 on Betfair. She was then followed by .. well we’re still waiting really. But that’s not to say there hasn’t been plenty of activity in the SPOTY markets..
Mo Farah was originally priced up as the favourite for the London marathon in places before the market corrected. Mo eventually finished in 8th and any prospect of him being SPOTY appeared to vanish. Last weekend Ronnie O’Sullivan gave up a healthy lead in the world snooker final to foil another SPOTY gamble (traded as big as 500 into 8.4 in Betfair). By far the biggest story of this SPOTY year so far though has been Steven Gerrard. He was heavily backed into as short as 1.74 (from a high of 150) on the back of Liverpool’s ten game winning streak that took them to within touching distance of their first English title since 1990. The dream now appears to be over and Gerrard has drifted off again as quickly as he came. The consistent Lewis Hamilton is the solid favourite having got off to a very good start in his shiny fast new F1 car. The above illustrates just how so much can happen, yet nothing much at all. And how, to my mind, it is one of the most interesting betting markets, providing entertainment and many varied trading opportunities. Here I aim to dissect and report on the market throughout the year, as well as the different sports and events that shape it. At the same time building up a profitable portfolio trading in the SPOTY market itself and in the sports markets involving the (perceived) potential protagonists.